Visit the Grand Canyon West Rim on this day trip from Las Vegas. Enjoy stunning view of the Grand Canyon, Hoover Dam and Lake Mead. Includes entry to the famous Grand Canyon Skywalk! What: Tour of the West Rim of the Grand Canyon. 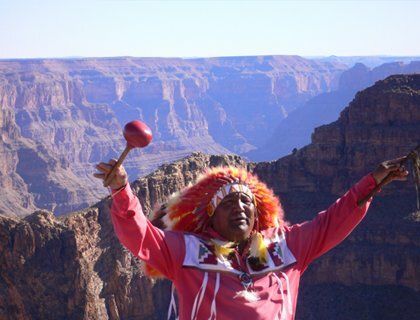 Don’t Miss: Eating lunch with members of the Hualapai Tribe – you can’t do THAT at home! Experience the rustic wilderness of Grand Canyon West on this tour of the Indian territory. You’ll be treated to stunning views of the Grand Canyon, the Hoover Dam and Lake Mead. Journey through the home of the big horn sheep, Black Canyon and 900 year old Joshua Tree Forest and enjoy a gourmet sandwich lunch. You ticket also includes a unique walk in the sky on the famous Grand Canyon Skywalk – a 70ft long glass bridge which towers 4,000 feet above the floor of the Canyon! Experience the majesty of the Grand Canyon West Rim on an unmissable full-day tour. Enjoy stunning views of the Grand Canyon, the Hoover Dam and Lake Mead. Travel through the Black Canyon and the 900 year-old Joshua Tree Forest. Exclusive Check-in at the Miracle Mile Shops at the Planet Hollywood Casino and Resort on the Strip. Your ticket includes a boxed gourmet sandwich lunch. Enjoy this unique destination at your leisure. See Eagle Point, the Skywalk, Guano Point, Indian Village, Hualapai Ranch, Cowboy Town and more. Guided tour to the Grand Canyon West Rim by deluxe motor coach, with a photo stop at Hoover Dam. Total tour duration is approximately 11½ hours, from hotel pick-up to drop-off. Passengers will be picked up from selected hotels in Las Vegas. Hotel pick-up is at approx. 6.30am Approximate return to Las Vegas is 4.45pm. This tour includes an English-speaking guide. For the walking sections of this tour, comfortable walking shoes with gripping soles are a must. It is recommended to bring sunscreen, hats and a camera. Within your tour vehicle water bottles, knapsacks, and extra hats and jackets will be provided for participant use. Indian reservation entry fee and boxed gourmet sandwich lunch. A small per person fuel surcharge is applicable to this tour. This must be paid locally.